When I put my first year of college behind me, I swore I would never ever live in student accommodation again. Not that I’d chosen to in the first place; it was in fact required of all new students to live on campus for a year, ostensibly to integrate them better into the fabric of college life, but really just to milk their parents dry of money in exchange for about ten square feet of living space. The lack of space was annoying, of course, but it was nothing compared to the other things: the constant parties, the loud music, the communal bathrooms (not a pretty sight on weekend mornings), not to mention the lack of cooking facilities (unsurprising since we were also required to purchase a year pass to the university’s prison-grade dining establishment). And then of course there was my roommate, a girl who spent her days pining for her boyfriend back home and her nights getting drunk at frat parties and stumbling home with various men even drunker than she. It certainly wasn’t all bad, but it was a living experiment I was not in a hurry to repeat, and as soon as my obligation to the university was fulfilled I was in my own apartment faster than you could crack open a bottle of bubbly to celebrate. Little did I know, though, that upon accepting my place for a PhD at Edinburgh, living in student accommodation would be the most attractive option. You see, as much as I loathed the idea, it made logistical sense: I was arriving in a new country, I had no idea where to look for someplace cheap, and I had very little money to put myself up somewhere while I searched. And because I was a student coming from abroad, all I had to do was tick a box and I would be guaranteed a place in a postgraduate hall of residence. So against my better instincts I accepted a room in Churchill House, a large modern building five minutes away from my new department, and in September 2001 moved in to begin what would become three of the most exciting years of my life. Life at Churchill House was different from my undergraduate dorm experience in just about every way: my co-inhabitants were older and less inclined to non-stop hedonistic excess, I had my own room, and most importantly there were adequate cooking facilities. In fact, life at Churchill House seemed to revolve around its kitchens, each of which was shared by about ten students from all over the globe. Sharing my kitchen that first year, for example, were people from Norway, Germany, Portugal, Greece, Nigeria, Jordan, and Lebanon (and I should point out that another kitchen on the same floor was home to a particular Estonian girl you may be familiar with now too). Now, of course there were ups and downs to living closely with strangers, particularly those of different cultural backgrounds, but because our main interaction happened in the kitchen there seemed to be considerably more ups than downs. Really, now that I think about it, sharing a cooking and eating space with these people was just about the most clever arrangement anyone could have dreamed up, since not only did we have such a vivid window into each others’ lives through food, but coming together to cook and eat created such a feeling of family between us. Over the course of that year, and the two that followed, we shared countless meals together, learned volumes about our respective cultures, and despite the occasional difference of opinion, made many life-long friends. It was kind of like a mini-United Nations, we used to joke, but brought together by cooking rather than politics. One of the friends I made during those three years was Aghlab, an architecture student from Jordan. When he first arrived in Churchill House he had very little experience cooking for himself, and one of our very first conversations involved him asking me how to boil a package of spaghetti, and not understanding why I advised him to only cook as much as he needed at one time, rather than boiling the whole bag and thus saving himself work later. On another occasion I walked into the kitchen to find him freaking out because a chicken leg he had just submerged in boiling water had started leaching blood. It didn’t take him long, though, to graduate from spaghetti and boiled chicken to the foods he knew from home, and soon it was me looking over his shoulder as he made hummus bi tahina topped with tender, crispy beef and hariseh, a semolina, yogurt and coconut cake. I also learned more than I ever knew about Arab pastries from him. Each time he went to Jordan he would come back with a huge tray of sweets to share, big ones and small ones in every imaginable shape, stuffed with fluorescent green pistachios and golden almonds and smelling richly of butter. Most of the pastries were variations on the familiar baklava, but some of them were not so familiar, sporting instead a type of pastry that looked like a head of uncombed hair, something I learned was called kataifi. 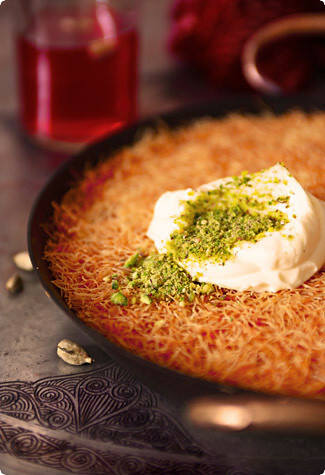 Although not nearly as familiar to Western eyes as filo, kataifi is widely used in the Middle East in similar ways, and features in a whole category of nut-based pastries which are basically variations of baklava with shaggy tops. If that were all it was used for, however, it would never have really drawn my attention – after all, I’m pretty attached to my baklava the way it is – but I learned that there is another sweet kataifi is used for which it is far more suited for. It’s a dessert called künefe – or knafe, depending on which Middle Eastern country you’re in – and features the shredded pastry bathed in melted butter and baked to a shatteringly crisp crust around a filling of soft cheese. True to tradition, the whole thing is drenched in syrup after it emerges from the oven, but here the web-like texture of the kataifi traps just the perfect amount to sweeten every bite, important since the cheese filling carries no sugar of its own. The whole thing is then served fresh from the oven (unlike baklava, which improves upon sitting) to preserve its contrast of crisp and soft textures. It is absolutely incredible, but don’t take my word for it – it’s also so easy to make that there is no excuse for anyone to not form their own opinion. I ran into Aghlab in the supermarket the other day for the first time in a long time – he’s one of the last members of our original kitchen left in Edinburgh. He asked me what I had been up to and I told him about my plans to attempt künefe, which brought a smile to his face and an excited flurry of opinions and advice. Listening to him talk, I was reminded again of how central food has always been to our friendship, and to so many who met in those residence-hall kitchens. And then it struck me – maybe there’s a lesson to be learned here. In an age when cultural and ideological cleavages are increasingly polarizing countries and communities, and where prejudices and misconceptions seem to be the driving force behind most of our policies, could a few good meals together be what everyone really needs to promote understanding? It may be a laughably simplistic notion, but after observing culinary diplomacy overcome just about every cultural, linguistic and political barrier imaginable, I can say it certainly seemed to work for us in Churchill House. 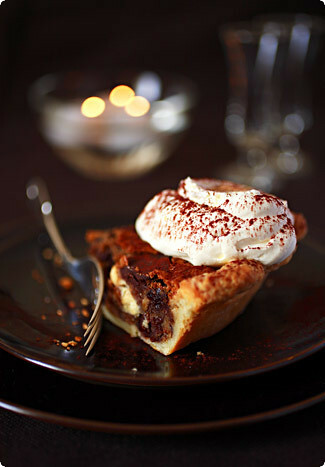 Notes: I could gush about this pastry all day, it’s that good. Nevertheless, the first time I made it I had an unmitigated disaster. Following Ana Sortun’s advice, I used buffalo mozzarella as a stand-in for the buffalo-milk clotted cream she says is used in Turkey. I don’t know what the intended texture was supposed to be, but mine turned out just this side of a rubber shoe sole. I absolutely loved the flavors in her syrup, however, so the second time I made it I took the advice of Arto der Haroutunian and used ricotta cheese which I enriched with a bit of mascarpone, and the result was far, far more successful. Too successful, in fact – I was planning on having leftovers to see how well it aged, but mysteriously there were none to be found the next day. Well, if you manage to have any left you can let me know. Preheat the oven to 375F/190C. Using a food processor or a large, sharp knife, cut the thawed kataifi into 1/2-inch (1cm) pieces (I actually cut it using kitchen shears). Toss the shreds in a large bowl, separating them with your fingers, and drizzle in the clarified butter and milk. Toss to combine thoroughly. Press half the pastry into the bottom of a 9-inch (23cm) baking pan – it should be quite compact. In a bowl stir together the ricotta and mascarpone cheeses, then spread in an even layer over the pastry. Top with the remaining pastry and press down in an even layer. Bake in the preheated oven until the top is golden brown and firm, about 40 minutes. While the künefe is baking, prepare the syrup. Bring the sugar, champagne, and cardamom to a boil in a medium saucepan and boil until reduced by about a third (there should be just over two cups of syrup). Remove from the heat and stir in the lemon juice, optional pomegranate juice and rosewater. Ladle about 2/3 of the syrup over the hot künefe. Put the rest in a small pitcher for people to add if they want more sweetness, and serve immediately, garnishing each piece of künefe with a scoop of cold mascarpone cheese and a sprinkle of chopped pistachios. While any new cookbook causes a considerable amount of excitement around here, few follow up that tingly sensation of new-book euphoria with one of pride. Well, there was that one of course, but in terms of the weighty-hardback, luscious-photo and impressive-coffee-table-adornment kind of pride, the book which arrived on my doorstep a few weeks ago from Singapore was a first. Of course my feelings may have had more than a little to do with the fact that I happen to know two of the marvellous people that worked on it. But more on that in a minute. Most of you who are regular foodblog readers will probably already be familiar with the name Justin Quek. 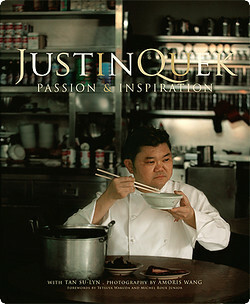 He has, after all, been taking the blog world by storm thanks to the recent release of his first book, Justin Quek: Passion and Inspiration. It didn’t take me more than a few pages to understand what all the fuss is about. Justin Quek, who currently lives and cooks in Taipei but originally hails from Singapore, draws upon years of training in top kitchens across Europe and Asia to create his signature cuisine. I’ve been trying to think of a good analogy for it, and so far the best I can come up with is what you might find on your plate if you hooked up Alain Ducasse, Thomas Keller and Chen Kenichi to a mad scientist’s brain-scrambler and then asked them to cook you dinner; chances are you’d get something creative, classic, exotic, a little bit playful and of course mindblowingly delicious. Even more amazing is how well Justin pulled things off in this book, since there is always a danger that books by restaurant chefs of this caliber will be beyond the capabilities or means of the home cook. Justin, however, negotiates this potentially tricky territory beautifully; while many of the dishes do feature expensive luxuries such as caviar, truffles and foie gras, there are just as many recipes that rely on everyday ingredients imaginatively put together: roasted duck with celery root puree and honey & raspberry vinegar sauce; braised pork belly with oriental spices and port wine; salad of grilled watermelon and roasted cherry tomatoes. The other thing that makes this book stand out, and which to me is nearly as important in a cookbook as the recipes themselves, is how deeply personal it is. Instead of the clinical, characterless books often written by chefs just interested in showing the world how they do what they do, Justin’s book delves into why he does what he does, with delightful stories of his childhood, culinary training and early professional life, and profiles of some of the people who have influenced him along the way. It’s a book as good to curl up and read as it is to cook from (or just salivate over – which I can’t help but do with such gorgeous photos!). But now for the best part. Justin wasn’t helped in this endeavor by some anonymous cadre of ghostwriters and editors, but by two of the blogosphere’s most famous names: Tan Su-Lyn, the book’s highly talented co-author, and her husband, Aun Koh – better known to us all as Chubby Hubby – who helped with many of the logistical aspects of the book. This wonder couple never ceases to amaze, do they? Serves: Justin says 6, but unless you’re serving this as part of a large tasting menu, I would say 3 or 4. To be safe, I doubled everything. Notes: This lovely little recipe appears in Justin’s ‘cheese course’ chapter, and shows how a couple of carefully-chosen ingredients and a little imaginative flair can transform something utterly simple into something worthy of the most elegant meal. Although I stuck to Justin’s recommended cheese and wine for this dish (the French blue cheese Fourme d’Ambert and a luscious young Sauternes), I would imagine that you could have equally delicious results substituting another creamy, mild blue cheese (perhaps dolcelatte or Saint Agur) and any dessert wine you have on hand (Muscat comes to mind, or even an icewine). Make the parfait ahead of time. Soak the gelatine leaf in cold water and set it aside. Place the cheese and 1 tablespoon of the whipping cream in a bowl and whisk over a bain marie for 2 minutes, or until the mixture is well blended (I melted them together in the microwave). Remove the gelatine leaf from the ice water and squeeze it dry before mixing it into the cheese and cream mixture. Whisk until dissolved, and allow to cool. Whisk the remaining cream until soft peaks form. Fold it into the cheese mixture and transfer to a container. Refrigerate for 3 hours, or until set. Next, make the Sauternes jelly. Soak the gelatine leaf in cold water and set it aside. Bring the sugar and Sauternes to a boil in a saucepan. Add the grapes and simmer for 10 minutes (I skipped this step, instead adding the grapes as a garnish). Remove the gelatine leaf from the water and squeeze dry before stirring it into the wine mixture. Spoon a thin layer into the bottoms of 4 soup plates and refrigerate to set. I was using brioche, I skipped the sautéing and toasted slices of it instead). 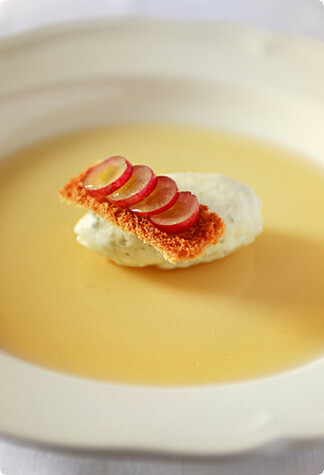 To assemble the dish, dip a dessert spoon in some water and use it to shape a quenelle of the parfait. Place one quenelle in each bowl atop the jelly, and top with the sautéed bread or toasted brioche and the sliced grapes (if you’ve left them out of the jelly).